Remember when I mentioned a project Jeffrey and I had been working on? We finished her at 2:42 this morning after a grueling hour of labor and 5 minutes of pushing. But more on that later. For now, I am just enjoying her. So far I have learned she is very cuddly and is seriously proud of her projectile pooping, and timing it to be in the middle of diaper changes. 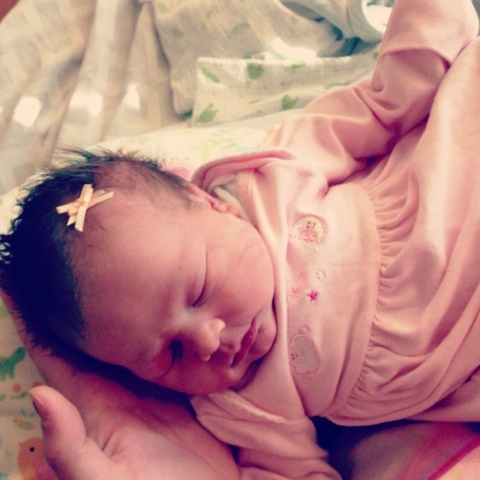 Her name is Everly Beth and she is perfect! Yea!!! Congrats!! So happy for you! Only 1 hour of labor?? How lucky is that. Lucas had the projectile pooping too, totally got me really good on MY birthday when he was a couple weeks old. HOLY CRAP GIRL!!! You are so on top of things! I can't believe you already have a blog post up! Go take a nap while you can! :) Love your guts- she's beautiful! Oh and PS - how big was she? Congrats!she is beautiful. I love her name. She is just beyond gorgeous! I am sooooo happy for you! And sooooo proud of you!